Week 49: Experts in authoritarianism advise to keep a list of things subtly changing around you, so you’ll remember. This was one of, if not the worst week for our country since Trump took office. As the length of the list reveals, this was a week of complete chaos and eroding norms. There was an observable sense of exhaustion, anger, sadness, fear and loss among Americans. With Trump effectively driving the narrative around his handling of a fallen soldier, there was little coverage or focus on most items on this list. Many of these news stories would in normal times be front page coverage for months. Investigations of Russian interference quietly progressed on several fronts, and alarmingly Trump and some prominent regime members continue to deny the existence of, and take steps to protect against Russian involvement. BuzzFeed reported a subpoena was issued in March by Summer Zervos’ lawyer to Trump for documents about “any woman alleging” Trump touched her inappropriately. Zervos is suing Trump for defamation. Larry Flynt took out a full-page ad in the Sunday edition of WAPO offering to pay $10MM for “information leading to the impeachment and removal from office” of Trump. The New Yorker reported on “Duty to Warn,” a group of psychiatrists mobilizing behind the 25th Amendment, who claim Trump “suffers from an incurable malignant narcissism” which makes him unfit to serve and dangerous. The Editorial Board of the San Francisco Chronicle published an op-ed, “California burns: Where’s the president?” as Trump for a second week was silent on CA’s deadliest wildfire. Mic reported Army recruiters have been instructed to stop enlisting green card holders “until further notice.” Barring green card holders from enlisting is against federal law. White supremacist Richard Spencer spoke at the University of Florida in his first campus speech since the “Unite the Right” rally in Charlottesville. His appearance was met with mass protests inside and outside the speech. FL Gov. Scott declared a state of emergency for Alachua County. University of Florida banned torches, masks, weapons, and athletic equipment that could be used as a weapon. Police announced three white nationalists were charged with attempted homicide after they argued with and fired a shot at a group of protestors following Spencer’s speech. On Friday, Mashable reported the EPA climate change website which was taken down in April, reappeared in part, but with all references to climate change removed. Forbes reported during the transition period, Wilbur Ross moved assets into family trusts, leaving more than $2 billion off his financial disclosure report. Forbes discovered the discrepancy based on magazine records. Ross’ moving of assets raises concerns of violating federal rules, and also, given his role as Secretary Commerce, potential for conflicts of interest. Rep. Elijah Cummings said “several” Trump aides have admitted to using private emails for government business and “confessed” that they failed to forward official records, in violation of federal record-keeping law. Rep. Trey Gowdy had joined Cummings in Week 46 to request details on private email use with an initial deadline of October 10. The WH did not fully respond. Now Cummings is concerned Gowdy is letting the WH slide. Trump will meet Philippine President Duterte on his upcoming trip to Asia. Duterte has come under international criticism for his brutal crackdown on drug trafficking, including thousands of extrajudicial killings. In a speech at the Heritage Foundation, Pruitt said the Trump regime plans to restrict scientists who get EPA grants from serving on the agency’s scientific advisory committees. Earlier this year, Pruitt failed to renew half of the membership of the 18-person Board of Scientific Counselors. He is considering more than 130 candidates who reject mainstream science on climate change. Trump nominee for drug czar, Tom Marino, withdrew from consideration after a WAPO/“60 Minutes” investigation detailed how he helped steer legislation that weakened the DEA’s ability to go after drug distributors. Anthony Alexis, the Consumer Financial Protection Bureau’s enforcement chief, announced he is stepping down. Alexis is the highest-profile official to leave the agency since Trump took office. A federal judge ruled Trump’s pardon of Arpaio will not wipe out the guilty verdict she returned or any other rulings in the case. The Court had found Arpaio guilty of criminal contempt. Arpaio’s lawyer will likely appeal. Politico reported Trump personally interviewed at least two candidates for US attorney positions in NY. One potential nominee would have jurisdiction over Trump Tower, and could investigate the Trump regime. CNN reported Trump also met with Jessie Liu who he tapped to be the next US attorney for the District of Columbia, where Trump now resides. On Monday, Trump had a pair of Q&A sessions, first in the Cabinet Room and then in the Rose Garden with Sen. Mitch McConnell. The sessions covered a variety of topics and were filled with false statements. Trump bragged about his performance in office in all areas. Trump fabricated that James Lee Witt, a FEMA administrator under Bill Clinton gave him an “A-plus” for handling the hurricanes, including Puerto Rico. A Yale Law School professor detailed how Trump admitting he is trying to kill Obamacare is illegal: “Modern American history has never seen as full-scale an effort to sabotage a valid law,” upheld twice by the SCOTUS. Also Monday, Trump said he and McConnell are “closer than ever before.” Bannon is waging a war on the GOP establishment, and has suggested opposition to McConnell as a litmus test for his support. When asked about his 12-day silence on US soldiers killed in an ambush in Niger, Trump claimed Obama and past presidents “didn’t make calls” to families of soldiers killed in duty. This is a false statement. On Tuesday, Trump evoked his chief of staff’s son to attack Obama, saying Obama “did not call Gen. Kelly after the death of his son.” Daily Beast confirmed WH officials signed off on this line of attack. CNN reported Kelly did not know Trump would use the death of his son publicly. Kelly and much of the WH were caught off guard. AP contacted the families of all 43 people who have died in military service since Trump took office and made contact with about 20 of them. More than half said they had not heard from Trump. Trump also complained how hard it was on him to make these calls, “It is a very difficult thing…it is a very, very tough day.” He, however, failed to mention the hardship on the families of fallen soldiers. Trump also claimed “absolutely no collusion” between his campaign and Russia, and blamed it as being an excuse by Democrats for losing. He also referenced Hillary repeatedly, saying he hoped she would run again. WAPO reported the Trump campaign spent $1.1 million in legal fees for the Mueller probe during the quarter ended September. In a sign of increased activity, $927K was spent during the first six months of the year. The Trump campaign and RNC continue to pay for Trump and Donald Jr.’s lawyer, but not for Trump campaign or WH staffers. Business Insider reported Veselnitskaya was acting as an agent for the Kremlin when she delivered a memo at the Trump Tower meeting. The same memo was given to Rep. Dana Rohrabacher at his Moscow visit in April 2016. The agents watched House of Cards to better understand American politics, and were instructed to repetitively post anti-Hillary comments about her wealth, private email server, and Bill Clinton’s administration. CNN reported House and Senate investigators are interviewing Matt Tait, a cybersecurity expert recruited by Republican operative Peter W. Smith, about Smith’s interactions with the Trump campaign. Tait has in the past said he believes Smith had connections with Flynn, Bannon, and Conway during the campaign. The Senate Intel Committee has also reached out to Eric York, another security expert enlisted by Smith. Business Insider reported Mueller has also interviewed Tait as part of the probe into the relationship between Peter Smith and Flynn, and their possible collusion with Russia to get Hillary’s deleted emails. Business Insider reported on tools used by a Cambridge Analytica intern which aid in targeting US voters on divisive issues. The tools were left unprotected online for a year, including the 8 months before the election. CNN reported based on documentation, Yevgeny Prigozhin, a Russian oligarch in Putin’s inner-circle, is thought to be behind the Russian troll farm in St. Petersburg called Internet Research Agency. On Monday, AL Republican Roy Moore’s Senate campaign said it does not know why more than 1K fake Twitter accounts originating from Russia started following Moore’s account, causing a spike in his following. The Senate Intel Committee subpoenaed Carter Page for documents and testimony as part of its Russia investigation. In a dramatic shift, Page who earlier said he was eager to testify, will likely evoke the Fifth Amendment. Politico reported Spicer was interviewed by Mueller’s team on Tuesday. Reportedly he was grilled on the firing Comey and his statements, as well as about Trump’s meetings with Lavrov and Kislyak in the Oval Office. Mueller’s team is actively interviewing Trump’s former and current aides. Priebus and Keith Kellogg, interim NSA after Flynn, have been interviewed. Hicks and McGahan are expected to be interviewed shortly. Khodorkovsky also said of Kushner’s meeting with VEB’s Gorkov last December, Gorkov was acting on behalf of the Kremlin. Kushner has said the meeting was to discuss business. Kushner added Charles Harder to his legal team. Vanity Fair speculated the addition may have come out of concern about Priebus’s testimony in Week 48, as relates to Kushner’s proximity to Trump’s decision to fire Comey. Daily Beast reported Donald Jr. and Conway pushed tweets by the Russian troll farm Internet Research Agency, including allegations of voter fraud, the week before Election Day. Trump aides and allies Flynn, Flynn Jr., Stone, Gorka, Parscale, and Ann Coulter retweeted or tweeted Russian troll farm content. Clint Watts said Russia can declare success: Americans using content against Americans. Politico reported the Senate Intel Committee interviewed Trump’s former campaign manager Corey Lewandowski on Wednesday. Lewandowski signed off on Page’s July 2016 trip to Moscow. The Senate Intel Committee announced it will postpone and reschedule its open hearing of Michael Cohen scheduled for Oct 25. In Week 45, the committee abruptly canceled their interview after Cohen breached terms. Politico reported a federal judge has tossed out a libel suit filed by Russian oligarch Deripaska alleging AP falsely implied he was paying Manafort to advance the goals of the Russian government and Putin. CNN reported RT is resisting the DOJ’s request that its American arm register under the Foreign Agents Registration Act. The DOJ deadline was October 17, but RT has not yet registered. McCain said the WH blocked its cyber czar, Rob Joyce, from testifying before the Senate Armed Services Committee on US efforts to defend against cyberattacks. McCain signaled Joyce could be subpoenaed. The CIA quickly issued a statement clarifying Pompeo’s remarks: “The intelligence assessment with regard to Russian election meddling has not changed.” Pompeo has a record of statements minimizing Russia. Putin entered American politics again, saying in an interview that Americans should not “disrespect” Trump. Putin also defended Trump’s voters and his nontraditional ways, and blamed the US media. The acting commissioner of Pennsylvania’s ObamaCare exchange said premiums are expected to spike by 31% for 2018 because of Trump’s decision to stop paying key subsidies. On Tuesday, at a news conference in the Rose Garden, Trump said he would support the Alexander-Murray deal, which would stabilize Obamacare insurance markets by restoring subsidies cut by Trump. On Wednesday, in an early morning tweet, Trump changed his positions: “can never support bailing out ins co’s who have made a fortune w/ O’Care.” He repeated his new position later in a tax reform meeting. McCain became the first Republican to sign onto a bill drafted by Sens. Amy Klobuchar and Mark Warner, the Honest Ads Act, which would increase the transparency of political advertisements on social media platforms. NPR revealed Trump National Golf Club, LA claims to have donated $5 million to charitable causes, and lists about 200 organizations. Many contacted said they never received the money, and only $800K was accounted for. WAPO reported in a June call, Trump offered a grieving military father $25K from his personal account, and said his staff would establish an online fundraiser for the family. The father said neither happened. Shortly after the WAPO story, the WH said Trump had sent a $25k check he promised to the father . Military families are privately concerned about a commander in chief writing checks to parents of fallen soldiers. On Wednesday, Sessions testified in front of the Senate Judiciary Committee during a five-hour, highly-contentious oversight hearing. Sessions repeatedly said his discussions with Trump were off-limits to lawmakers. Sessions acknowledged he discussed Comey with Trump before writing the letter that was used to justify the firing, but refused in questioning to share what Trump said to him about Comey. On Tuesday night, Rep. Frederica Wilson told CNN she had overheard Trump’s condolence call to Army Sgt. La David Johnson’s widow, Myeshia Johnson. Wilson said Myeshia “broke down” during the call. Wednesday morning, Trump tweeted Wilson had fabricated what he said, adding “(and I have proof). Sad!” No proof has been given. Trump repeated his claim later when asked by a reporter about his statement: “I didn’t say what that congresswoman said; didn’t say it all. She knows it.” The WH did not confirm or deny Wilson’s account. Army Sgt. La David Johnson body wasn’t found until two days after he was killed in Niger. Johnson was one of four Green Berets killed in an ambush. Rachel Maddow reported Trump’s behavior may have been a diversion away from explaining what happened in Niger. Two weeks later there still has not been an explanation of the mission or the ambush. Politico reported staffers at the NSC drafted a Niger sympathy statement for Trump on October 5. Trump never released the statement. On Thursday, McCain, chairman of the Senate Armed Services Committee said the Trump regime has not been forthcoming about the attack in Niger, and that he may subpoena to get access to information he wants. LA Times reported that General Waldhauser, commander of U.S. Africa Command, asked for more military resources in March. CNN reported Sgt. La David Johnson’s body was found nearly a mile from the ambush. On Thursday, the Pentagon announced it has sent a team to Niger to conduct a “review of the facts,” of what happened on October 4. It is still not known with certainty what group carried out the attack. On Thursday, Kelly delivered an impassioned defense of Trump and his call to Johnson’s widow, evoking his own experience with the loss of his son and his experience in the military as a four-star general. Kelly drew ire for referencing that in his day women were “sacred, looked upon with great honor,” given Trump’s record with women, and for saying Gold Star families should be off-limits given Trump’s attacks of the Khans. Kelly attacked Wilson, saying he was “stunned” by her account, and she exhibited “selfish behavior.” Kelly chastised Wilson, “empty barrels making the most noise” for allegedly saying she helped get funding for a building. Miami Herald reported Kelly got his facts wrong attacking Wilson. Kelly claimed Wilson said “she got the money” for a new building during a 2015 ceremony. Wilson was not in Congress when the money was secured. On Friday, Sun Sentinel released a full video of Wilson’s remarks. Wilson took credit for securing approval for the naming of the building. She did not take credit for funding. On Friday afternoon, the WH stood by Kelly issuing a statement repeating the “empty barrel” assertion and attacking Wilson even though the video showed his claim was false. On Friday afternoon at the press briefing, press secretary Sanders said it’s “highly inappropriate” to get into a debate with a four-star general. WAPO listed several four-star generals Trump has publicly bashed. On Friday, Trump signed an executive order allowing the Air Force to recall as many as 1k retired pilots to active duty. The order is not specific to the Air Force, and could be used to call up more officers in other branches. Bennie Thompson, the ranking Democrat on the House Homeland Security Comm, called for an investigation of drinking water in Puerto Rico. As per Week 48, Puerto Ricans are drinking from a Superfund site. CNN reported only 33 of the 250 beds (16%) on the USNS Comfort are being used, nearly two weeks after the ship arrived. On Thursday, at a press conference with Puerto Rico’s governor, Trump rated his handling of disaster relief as 10 out of 10. Recent polls show Americans give him a rating of 4 out of 10. The official death toll count remains at 48, but as per VOX in Week 48, the actual count could be hundreds more. Senators Markey and Warren, and Reps. Velazquez and Thompson have asked for an audit of the death count. On Wednesday, CREW started its case against Trump in the Southern District of NY, saying he violated the Emoluments Clause of the Constitution by continuing to own and profit from his businesses. Jacksonville Jaguars owner Shad Khan said Trump’s recent grudge against the NFL is because Trump’s bid to buy the Buffalo Bills in 2014 failed. On Thursday, Former CIA Director John Brennan said Trump has escalated tensions with N. Korea to a dangerous level, and that Cabinet members and senior officials may need to step in as “governors” to prevent war. A federal judge Wednesday barred the Trump regime from blocking an undocumented immigrant teen “Jane Doe” from getting an abortion. The judge said she was “astounded” the regime was trying to block the teen. A federal appeals court Friday said Jane Doe could get an abortion, but would need a sponsor. Trump’s HHS in March announced federally funded shelters are prohibited from providing abortion to unaccompanied minors. Politico reported Trump officials were blindsided and are scrambling to come up with an opioid plan after Trump’s off-script statement Monday where he promised to deliver an emergency declaration next week. Newsweek reported Sen. Ben Cardin, ranking member of the Senate Foreign Relations Committee, joined House democrats in demanding Ivanka’s security clearance be reviewed given her failure to divest from her business empire. Daily Beast reported at the end of a tumultuous week, WH aides say Trump show zero remorse, and he “loved Kelly’s performance” and “considers the issue won.” Kelly however is looking more and more dispirited. On Friday in a tweet, Trump falsely blamed a 13% rise in UK crime on “Radical Islamic terror.” A report by the UK’s Office of National Statistics out Thursday said the increase was due to knife crime and sexual offenses. Smithsonian reported on a survey which found a spike in fear. In 2017, Americans are afraid of five items, up from one in prior years. Americans also have “a great fear of some of the things happening in this presidency.” The most feared item is corruption of government officials (74%). As the week drew to a close, 32 days after Hurricane Maria hit Puerto Rico, just 16.6% of the island has electricity, and 71.7% drinking water. 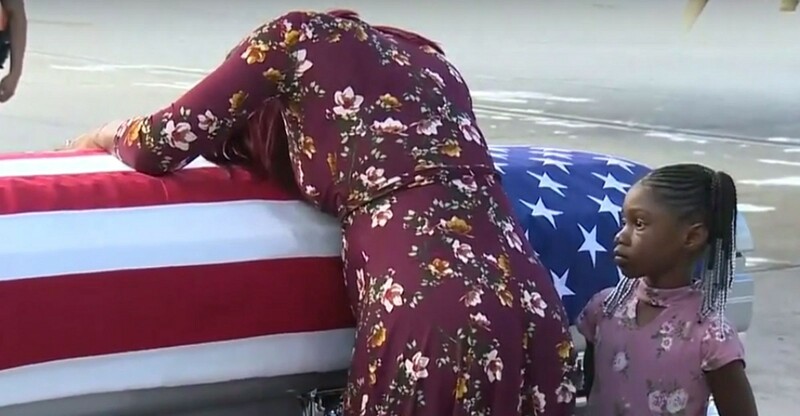 Myeshia Johnson cries over the casket of her husband, Sgt. La David Johnson, who was killed in an ambush in Niger, upon his body’s arrival in Miami (credit: WFOR/@cbsmiami).